If you thought Trainspotting was intense, then prepare for something even more delightfully fucked up. The bizarre design of the poster you see here is a great signifier of things to come, exemplifying just how messed up we British really are when it comes to filmmaking. Strangely, and for reasons unknown, it proves to be some of the best in the industry. Filth depicts the misadventures of Detective Sergeant Bruce Robertson (James McAvoy), a gleefully corrupt copper who embraces opportunities to snort drugs, fondle women and screw up the lives of others. His dangerous attitude ends up fuelling his mission to achieve a promotion within his force, but his decaying state of mind begins to take its toll and render the promotion the very least of his worries. When Filth strives to delve into the complex mindset of the antihero and thrust the chaos onto the audience, it really works. Freaky, disturbing yet vastly enthralling, Filth flawlessly relays the negative energy empowering Bruce Robertson's thought process onto the audience to great effect - there are moments that make you jump, moments that make you cringe and plenty that make you laugh. The fusion of genres is handled perfectly and the end result is an enjoyably unsettling narrative. 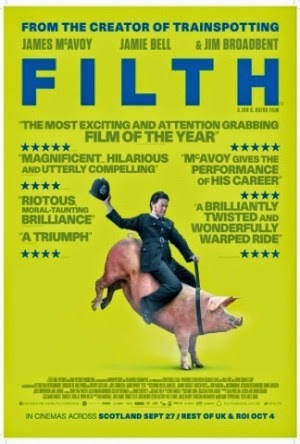 All the cinematic and genre techniques are hit firmly on the head; but when it comes to dialogue and telling a story, Filth is sometimes hard to connect with. Lightning fast speech, some of which very vaguely explains crucial plot details, as well as an occasionally confusing structure cause the story to be lost in translation. The narrative setup as the film begins is only really to get things going, for the main focus is Robertson and his unhealthy state of mind. But the story is often difficult to fully understand, and as the film begins to conclude the direction feels slightly clumsy and misplaced. Despite this, every scene is still made better with well timed comedy and a flawless performance by McAvoy. A boring third act also detracts from the overall quality and everything wraps up in a very loose manner. The level of subjectivity within the film's content makes interpretation amongst audiences vastly entertaining, but sometimes the lack of solidity within the concepts explored weakens the emotional punch some of them intend to exude. Filth works as a whole and proves to be a disturbingly satisfying experience - it won't have the biggest fanbase ever, but anyone willing to explore the madness within should definitely give it a watch.